Graham's younger sister Flenn feature's prominently in this satisfying sequel to author Brian Clopper's equally excellent "Graham the Gargoyle." When Blord, the village jerk, catches her using a spell scroll to go to places she shouldn't go, things get sticky for this smart little gargoyle who finds she has to lie to protect herself and her brave older brother from the harsh punishment that would surely come if word of her traveling got back to the village council. Meanwhile, Graham and Flenn also find themselves fighting both the extinction of a few isolated magical races (including their own!) due to a "lack of belief," and a dark and sinister force lurking in the woods around their village and the village of Graham's best friend, Ot the Troll. 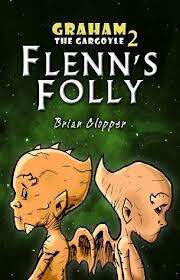 Told with plenty of heart and good humor, Flenn's Folly is a delightful tale that will easily entertain middle grade readers with its exciting action and fun exploration of the fascinating mythological creatures that people the fantastical world of Cascade. Recommended.